For the racehorse, see Grand Armee (horse). The Grande Armée (French pronunciation: ​[ɡʀɑ̃d aʀme]; French for Great Army) was the army commanded by Napoleon I during the Napoleonic Wars. From 1805 to 1809, the Grande Armée scored a series of historic victories that gave the French Empire an unprecedented grip on power over the European continent. Widely acknowledged to be one of the greatest fighting forces ever assembled, it suffered terrible losses during the French invasion of Russia in 1812 and never recovered its tactical superiority after that campaign. It was renamed in 1805 from the army that Napoleon had assembled on the French coast of the English Channel for the proposed invasion of Britain. 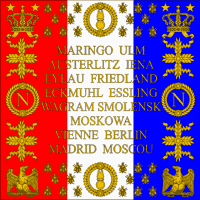 Napoleon later deployed the army east in order to eliminate the threat of Austria and Russia, which were part of the Third Coalition assembled against France. Thereafter, the name was used for the principal French army deployed in the Campaigns of 1805 and 1807, where it got its prestige, and 1809, 1812, and 1813–14. In practice, however, the term Grande Armée is used in English to refer to all of the multinational forces gathered by Napoleon in his campaigns of the early 19th century (see Napoleonic Wars). The army grew as Napoleon spread his power across Europe. It reached its largest size of 1,000,000 men at the start of the invasion of Russia in 1812, with 680,000 men participating in the Russian campaign. The contingents were commanded by French generals, except for the Polish corps and an Austrian one. The huge multinational army marched slowly east, and the Russians fell back with its approach. After the capture of Smolensk and victory in the Battle of Borodino, Napoleon and a part of the Grande Armée reached Moscow on 14 September 1812. However, the army was already drastically reduced because of deaths and injuries from battles with the Russians, disease (principally typhus), desertion, and long communication lines. The army spent a month in Moscow but was ultimately forced to march back westward. It started to suffer from cold, starvation and disease, and was constantly harassed by Cossacks and Russian irregulars, so that the Grande Armée was utterly destroyed as a fighting force. Only 120,000 men survived to leave Russia (excluding early deserters). Of these, 50,000 were Austrians, Prussians, and other Germans, 20,000 were Poles, and just 35,000 Frenchmen. As many as 380,000 died in the campaign. Napoleon led a new army to the Battle of the Nations at Leipzig in 1813, in the defence of France in 1814 and in the Waterloo Campaign in 1815, but the Napoleonic French army would never regain the heights of the Grande Armée of June 1812. For a history of the French army in the period 1792–1804 during the wars of the First and Second Coalitions see French Revolutionary Armies. The Grande Armée was originally formed as L'Armée des côtes de l'Océan (Army of the Ocean Coasts) intended for the invasion of England, at the port of Boulogne in 1803. Following Napoleon's coronation as Emperor of the French in 1804, the Third Coalition was formed against him and La Grande Armée turned its sights eastwards in 1805. They left the Boulogne camps late in August and through a rapid march surrounded General Karl Mack's isolated Austrian army at the fortress of Ulm. The Ulm Campaign, as it came to be known, resulted in 60,000 Austrian captives at the cost of just 2,000 French soldiers. By November Vienna was taken. However, Austria refused to capitulate, maintaining an army in the field. In addition, their Russian allies had yet to commit to action. The war would continue for a while longer. Affairs were decisively settled on December 2, 1805, at the Battle of Austerlitz, where a numerically inferior Armée routed a combined Russo-Austrian army led by Czar Alexander I. The stunning victory led to the Treaty of Pressburg on December 26, 1805, with the dissolution of the Holy Roman Empire coming the following year. The alarming increase of French power in Central Europe disturbed Prussia, which had remained neutral in the conflicts of the previous year. After much diplomatic wrangling, Prussia secured promises of Russian military aid and the Fourth Coalition against France came into being in 1806. La Grande Armée advanced into Prussian territory with the famed bataillon-carré ("battalion square") system, whereby corps marched in close supporting distances and became vanguards, rearguards, or flank forces as the situation demanded, and severely defeated the Prussian armies at the Battle of Jena and the Battle of Auerstadt, both fought on October 14, 1806. After a legendary pursuit, the French captured about 140,000 Prussians and killed and wounded roughly 25,000. Davout's III Corps, the victors at Auerstadt, received the honours of first marching into Berlin. Once more, the French had defeated an enemy before allies could arrive, and once more, this did not bring peace. Napoleon now turned his attentions to Poland, where the remaining Prussian armies were linking up with their Russian counterparts. A difficult winter campaign produced nothing but a stalemate, made worse by the Battle of Eylau on February 7–8, 1807, where Russian and French casualties soared for little gain. The campaign resumed in the Spring and this time Bennigsen's Russian army was soundly defeated at the Battle of Friedland on June 14, 1807. This victory produced the Treaty of Tilsit between France and Russia in July, leaving Napoleon with no enemies on the continent. Portugal's refusal to comply with the Continental System led to a punitive French expedition in late 1807. This campaign formed the basis for the Peninsular War, which was to last six years and drain the First Empire of vital resources and manpower. The French attempted to occupy Spain in 1808, but a series of disasters prompted Napoleon to intervene personally later in the year. The 125,000-strong Grande Armée marched forward, capturing the fortress of Burgos, clearing the way to Madrid at the Battle of Somosierra, and forcing the Spanish armies to retreat. They then engaged Moore's British army, prompting the British to withdraw from the Iberian Peninsula after a heroic action at the Battle of Corunna on January 16, 1809. The campaign was successful, but it would still be some time before the French were able to occupy Southern Spain. Meanwhile, a revived Austria was preparing to strike. The War Hawks at the court of Emperor Francis I convinced him to take full advantage of France's preoccupation with Spain. In April 1809, the Austrians opened the campaign without a formal declaration of war and caught the French by surprise. They were too slow to exploit their gains, however, and Napoleon's arrival from Paris finally stabilized the situation. The Austrians were defeated at the Battle of Eckmühl, fled over the Danube, and lost the fortress of Ratisbon. But they still remained a cohesive, fighting force, which meant further campaigning was required to settle the issue. The French captured Vienna and attempted to cross the Danube via Lobau island southeast of the Austrian capital, but they lost the subsequent Battle of Aspern-Essling, the first defeat for La Grande Armée. A second attempt to cross the river proved more successful in July and set the stage for the two-day Battle of Wagram, where the French emerged victorious, inflicting some 40,000 casualties on the Austrians, but themselves suffering 37,000. The defeat demoralized the Austrians so heavily that they agreed to an armistice shortly afterwards. This eventually led to the Peace of Schönbrunn in October 1809. La Grande Armée had brought the Fifth Coalition to an end and the Austrian Empire lost three million citizens as a result of the treaty's border changes. The new Grande Armée was somewhat different from before; over half of its ranks were now filled by non-French conscripts coming from satellite states or countries allied to France. The behemoth force crossed the Niemen on June 23, 1812, and Napoleon hoped that quick marching could place his men between the two main Russian armies, commanded by Barclay de Tolly and Bagration. However, the campaign was characterized by many frustrations, as the Russians succeeded no less than three times in evading Napoleon's pincers. A final stand for the defence of Moscow led to the massive Battle of Borodino on September 7, 1812. There the Armée won a bloody but indecisive and arguably Pyrrhic victory. Seven days after Borodino, La Grande Armée entered Moscow only to find the city largely empty and ablaze. Its soldiers were now forced to deal with the fires while hunting down the arsonists and guarding Moscow's historic districts. Napoleon and his army spent over a month in Moscow, vainly hoping that the Czar would respond to the French peace feelers. After these efforts failed, the French set out on October 19, now only a shadow of their former selves. The epic retreat over the famous Russian Winter dominates popular conceptions of the war, even though over half of the French army had been lost during the Summer. The French were harassed repeatedly by the converging Russian armies, Ney even conducting a famous rearguard separation between his troops and the Russians, and by the time the Berezina was reached Napoleon only had about 49,000 troops and 40,000 stragglers of little military value. The resulting Battle of Berezina and the monumental work of Eblé's engineers saved the remnants of the Armée. Napoleon left his men in order to reach Paris and address new military and political matters. Of the 690,000 men that comprised the initial invasion force, only 93,000 survived. The catastrophe in Russia now emboldened anti-French sentiments throughout Germany and Austria. The Sixth Coalition was formed and Germany became the centrepiece of the upcoming campaign. With customary genius, Napoleon raised new armies and opened up the campaign with a series of victories at the Battle of Lützen and the Battle of Bautzen. But due to the poor quality of French cavalry following the Russian campaign, along with miscalculations by certain subordinate Marshals, these triumphs were not decisive enough to permanently conclude the war, and only secured an armistice. Napoleon hoped to use this break to increase the quantity and improve the quality of his Armée, but when Austria joined the Allies, his strategic situation grew bleak. The campaign reopened in August with a significant French victory at the two-day Battle of Dresden. However, the adoption of the Trachenberg Plan by the Allies, which called for avoiding direct conflict with Napoleon and focusing on his subordinates, paid dividends as the French suffered defeats at Katzbach, Kulm, Großbeeren, and Dennewitz. Growing Allied numbers eventually hemmed the French in at Leipzig, where the famous three-day Battle of the Nations witnessed a heavy loss for Napoleon when a bridge was prematurely destroyed, abandoning 30,000 French soldiers on the other side of the Elster River. The campaign, however, did end on a victorious note when the French destroyed an isolated Bavarian army which was trying to block their retreat at Hanau. "The Grand Empire is no more. It is France herself we must now defend" were Napoleon's words to the Senate at the end of 1813. The Emperor managed to raise new armies, but strategically he was in a virtually hopeless position. Allied armies were invading from the Pyrenees, across the plains of Northern Italy, and via France's eastern borders as well. The campaign began ominously when Napoleon suffered defeat at the Battle of La Rothière, but he quickly regained his former spirit. In the Six Days' Campaign of February 1814, the 30,000-man French army inflicted 20,000 casualties on Blücher's scattered corps at a cost of just 2,000 for themselves. They then headed south and defeated Schwarzenberg at the Battle of Montereau. These victories, however, could not cure such a bad situation, and French defeats at the Battle of Laon and the Battle of Arcis-sur-Aube dampened moods. At the end of March, Paris fell to the Allies. Napoleon wanted to keep fighting, but his marshals refused, forcing the Emperor of the French to abdicate on April 6, 1814. After returning from Elba in February 1815, Napoleon busied himself in making a renewed push to secure his Empire. For the first time since 1812, the Army of the North he would be commanding for the upcoming campaign was professional and competent. Napoleon hoped to catch and defeat the Allied armies under Wellington and Blücher in Belgium before the Russians and Austrians could arrive. The campaign, beginning on June 15, 1815, was initially successful, leading to victory over the Prussians at the Battle of Ligny on June 16; however, poor staff work, and bad commanders led to many problems for the French army throughout the entire campaign. Grouchy's delayed advance against the Prussians allowed Blücher to rally his men after Ligny and march on to Wellington's aid at the Battle of Waterloo, which resulted in the final, decisive defeat for Napoleon and his beloved army. The first modern use of a General Staff was in the French Revolutionary Wars, when General Louis Alexandre Berthier (later the first Marshal of the Empire) was assigned as Chief of Staff to the French Army of Italy in 1795. Berthier was able to establish a well-organized staff support team. Napoleon Bonaparte took over the army the following year and rapidly came to appreciate Berthier's system, adopting it for his own headquarters, although Napoleon's usage was limited to his own command group. The Maison Militaire de l'Empereur (Military Household of the Emperor) was Napoleon's personal military staff and included the department of aides-de-camp (ADCs), orderly officers (until 1809), the Emperor's Cabinet with the Secretariat, a department that collected intelligence about the enemy using spies and the topographical department. Attached was also the Emperor's Civil Cabinet that included the office of the Grand Marshal of the Palace and the Grand Écuyer. The officiers d'ordonnance (orderly officers) may be considered as junior ADCs, with the rank of chef d'escadron, captain or lieutenant. They, too, were used for special missions such as reconnaissance and inspections, but also to carry written orders. In 1806, when these posts were created, they were members of the Imperial Guard; in 1809, while retaining their military status, they were taken under control of the Grand Écuyer in the Emperor's Civil Household. The decrees regulating their service were signed on 15, 19 and 24 September 1806 and finally on 19 September 1809. Louis Alexandre Berthier acted as Napoleon's Chief of Staff from 1796 until 1814, after his death being replaced by Jean-de-Dieu Soult during the Hundred Days. The role of Chief of Staff in the Grande Armée became almost synonymous with Marshal Louis Alexandre Berthier, who occupied this position in almost all the major campaigns of Napoleon. The General Headquarters was Berthier's unique domain and the Emperor respected this demarcation. Its personnel received orders only from Berthier and even Napoleon did not interfere in its immense tasks; he would never walk in on Berthier's private staff while they were writing and copying the orders that he had just given. Since the Emperor was his own "operations officer", it can be said that Berthier's job consisted of absorbing Napoleon's strategic intentions, translating them into written orders and transmitting them with the utmost speed and clarity. He also received in the Emperor's name the reports of the marshals and commanding generals and when necessary signed them on Napoleon's behalf. Detailed reports on everything that occurred for good or ill were to be sent to Berthier, who would in turn select the most important ones and transmit them to the Emperor; nothing was to be concealed from Napoleon. One of the most important factors in the Grande Armée's success was its superior and highly flexible organization. It was subdivided into several Corps (usually from five to seven), each numbering anywhere between 10,000 and 50,000, with the average size being around 20,000 to 30,000 troops. These Corps d'Armée were self-contained, smaller armies of combined arms, consisting of elements from all the forces and support services discussed below. While capable of fully independent operations and of defending themselves until reinforced, the Corps usually worked in close concert together and kept within a day's marching distance of one another. The Corps would often follow separate routes on a wide front and were small enough to live by foraging, allowing fewer supplies to be carried. Through dispersion and the use of forced marches the Grande Armée was often able to surprise opposing armies by its speed of manoeuver. A Corps, depending on its size and the importance of its mission, was commanded by a Marshal or général de division (Major General). Napoleon placed great trust in his Corps commanders and usually allowed them a wide freedom of action, provided they acted within the outlines of his strategic objectives and worked together to accomplish them. When they failed to do this to his satisfaction, however, he would not hesitate to reprimand or relieve them and in many cases took personal command of their Corps himself. Corps were first formed in 1800, when General Moreau divided the Army of the Rhine into four Corps. These were only temporary groupings, however, and it was not until 1804 that Napoleon made them permanent units. He would sometimes form the cavalry into separate Corps, so they would be able to move and mass more quickly without being slowed by the infantry or foot artillery. The main tactical units of the Corps were the divisions, usually consisting of 4,000 to 10,000 infantry or 2,000 to 4,000 cavalrymen. These in turn were made up of two or three brigades of two regiments apiece and supported by an artillery brigade of three or four batteries, each with six field cannons and two howitzers, making 24 to 32 guns in all. The divisions were also permanent administrative and operational units, commanded by a général de division and likewise capable of independent actions. France's Imperial Guard (Garde Impériale) was the elite military force of its time and grew out of the Garde du Directoire and Garde Consulaire. It was, quite literally, a Corps d'Armée itself with infantry, cavalry and artillery. Napoleon wanted it also to be an example for the entire army to follow, and a force that, since it had fought with him over several campaigns, was completely loyal. Although the infantry was rarely committed en masse, the Guard's cavalry was often thrown into battle as the killing blow and its artillery used to pound enemies prior to assaults. Grenadiers à Pied de la Garde Impériale (Imperial Guard Foot Grenadiers): The Grenadiers of the Guard was the most senior regiment in La Grande Armée. During the 1807 campaign in Poland, the Grenadiers were given the nickname les grognards ("the grumblers") by Napoleon himself. They were the most experienced and brave infantrymen in the Guard, some veterans having served in over 20 campaigns. To join the Grenadiers, a recruit had to have been under the colours for at least 10 years, have received a citation for bravery, be literate and be over 178 cm tall. The troops of the Old Guard were usually held in reserve for crucial moments on the battlefield and unleashed to act as a hammer blow to a shaken enemy, the 1st regiment of Grenadiers à Pied saw heavy action at the Battle of Eylau. By 1815, the Old Guard grenadiers numbered four regiments, the 3e Grenadiers and 4e Grenadiers having been added in 1810 and 1815 respectively. These regiments (3rd, 4th grenadiers) plus the older 2nd grenadiers were fully engaged at Ligny. Two days after Ligny, it was these regiments which were defeated by the British as they advanced to in an attempt smash the weakened British line at Waterloo, the two battalions of the 1st Grenadiers formed square and fended off allied attacks to protect the general retreat. The Grenadiers à Pied wore a dark blue habit long (coat with long tails) with red turnbacks, epaulettes and white lapels. The Grenadiers most distinguishing feature was the tall bearskin hat, decorated with an engraved gold plate, a red plume and white cords. Fusiliers-Chasseurs: In 1806, the Fusiliers-Chasseurs was formed as a regiment of middle guard infantry. All members of the Middle guard were veterans of 2–3 campaigns, and were commissioned as NCOs in the Line regiments. Arguably the best infantry of the entire Guard, the Fusiliers-Chasseurs most often operated together with its sister formation, the Fusiliers-Grenadiers, as part of a Guard Fusilier-Brigade. The Fusilier-Chasseurs saw extensive action, proving their worth time and time again, until they were disbanded in 1814 following Napoleon's abdication. The Fusiliers-Chasseurs were not reformed in 1815 for the Waterloo campaign. Fusiliers-Chasseurs wore a dark blue habit (or coat) with green epaulettes fringed red, red turnbacks and white lapels. Under this they wore a white waistcoat and either blue or brown trousers. The Fusiliers-Chasseurs shako had white cords and a tall red over green plume. The Fusiliers-Chasseurs were armed with a Charleville modele 1777 musket, bayonet and a short sabre. Marins de la Garde (Marines of the Guard): Sometimes translated as The Seamen of the Guard, were formed in 1803, with their initial purpose being to man the vessel transporting the Emperor during the expected crossing of the English channel prior to the invasion of England. The battalion was formed with five équipages (or crews), companies in all but name. After the cancellation of the invasion, the Marines remained a part of the Guard, manning whatever boat, barge or other water vessel Napoleon traveled in, as well as acting as a combat unit. Seamen of the Guard wore navy blue hussar-style dolman jackets, laced gold, with navy blue Hungarian style trousers decorated with gold lace. They wore a shako trimmed in Gold with a tall red plume. Seamen were armed as infantry, with a Charleville modele 1777 musket and bayonet, and many seamen were also equipped with pistols, less cumbersome during their engineering tasks. In 1804, the Cavalry of the Guard consisted of two regiments, the Chasseurs à Cheval and the Grenadiers à Cheval, along with a small unit of elite Gendarmes and a squadron of Mamelukes. A third regiment was added in 1806, the Regiment de Dragons de la Garde Impériale (Later known as the Dragons de l'Imperatice, the Empress Dragoons). 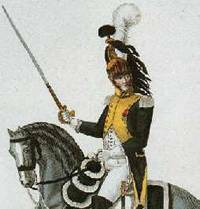 Following the Campaign in Poland in 1807, a regiment of Polish Lancers, the Regiment de Chevau-Légers de la Garde Impériale Polonais was added. The final addition was made in 1810, with another Regiment of Lancers, this time drawn from French and Dutch recruits, the 2e Regiment de Chevau-Légers Lanciers de la Garde Impériale or Red Lancers. The cavalry of the Guard was involved in combat numerous times, and with few exceptions proved its worth in action. Imperial Guard Horse Grenadiers (Grenadiers à Cheval de la Garde Impériale): Known as the Gods or the Giants, these troopers were the elite of Napoleon's guard cavalry and the mounted counterparts of the Grognards. The Horse Grenadiers wore tall bearskins, dark blue coats and collars, white lapels and tall boots. The entire formation was mounted on large black horses. A prospective recruit had to be over 176 cm tall, have accrued 10 years of service serving in a minimum of four campaigns, and have received a citation for bravery. The Grenadiers performed admirably at Austerlitz, where they defeated the Russian Guard Cavalry, but their most famous combat was at the Battle of Eylau. After standing under the fire of sixty Russian guns for a time, the troopers began to search for cover. Their commander, Colonel Louis Lepic, ordered the troops "Up with your heads gentlemen, those are only bullets, not turds". Soon after they joined Murat's charge into the Russian lines. The Horse Grenadiers, together with the Polish Lancers, were the only Guard Cavalry units never beaten in battle. 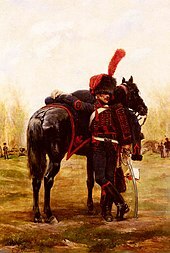 Imperial Guard Horse Chasseurs (Chasseurs à cheval de la Garde Impériale): Known as the "Favoured Children" (connotations of Spoiled Brats), the Chasseurs à Cheval of the Guard were the light cavalry of the Guard, Napoleon's favourites and one of the most recognisable units in La Grande Armée. In 1796, during the Italian Campaign, Napoleon ordered the formation of a bodyguard unit after he narrowly escaped an attack by Austrian light cavalry at Borghetto while at lunch. This 200-man unit of Guides was the forerunner of the Chasseurs à Cheval of the Guard, and their close affiliation with the Emperor was shown by the fact that he often wore the uniform of a Colonel of their regiment. In their flamboyant green, red and gold hussar style uniforms, the chasseurs were known to exploit their position as the emperor's favourites, showing poor discipline and even insubordination on some occasions. They first saw combat during the battle of Austerlitz, where they played a role in defeating the Russian Guard cavalry. During the Peninsular War the Chasseurs were ambushed by a large British cavalry force at Benavente in 1808 and defeated. They regained their reputation by showing extreme bravery during the Battle of Waterloo. Elite Gendarmes (Gendarmerie d'Elite): Nicknamed The Immortals because they rarely saw combat, the Gendarmes nonetheless performed a vital role. Gendarmes were the military police of La Grande Armée. Along with maintaining security and order near the headquarters, the Gendarmes would provide honour guards for high-ranking visitors, interrogate prisoners and protect the Emperor's personal baggage. The Gendarmes wore dark blue coats with red lapels and tall boots, along with a bearskin slightly smaller than that of the Horse Grenadiers. After 1807, the Gendarmes began to see more combat, distinguishing themselves in guarding the Danube bridge at Aspern-Essling in 1809. Squadron of Mamelukes (Escadron de Mamelouks): Fearsome desert warriors, whose loyalty Bonaparte purchased during his Egyptian campaign. They combined superb horsemanship and swordsmanship with fanatical courage. Often romantically viewed as "authentic sons of the desert" or even "head-hunters", their officers were French, the NCOs and ranks comprised not only Egyptians and Turks but Greeks, Georgians, Syrians and Cypriots as well, and even many of them were French. Originally they were an attached company (or "Half-Squadron") of the Chasseurs-a-Cheval de la Garde. They distinguished themselves at Austerlitz in 1805, winning their own standard, a second trumpeter and promotion to full squadron. This unit eventually became part of the Old guard, and served the Emperor right up to Waterloo. In 1813, a second Mameluke company was raised and attached to the Young guard. As with their predecessors, they were incorporated into the Chasseurs, and served alongside them during the Hundred days in 1815. By this time the personnel comprised almost exclusively of Frenchmen. Their distinct and colourful uniforms consisted of a green (later red) cahouk (hat), white turban, a loose shirt and a vest and red saroual (baggy trousers), with yellow, red or tan boots. Their weapons consisted of a long, curved Scimitar, a brace of pistols and a dagger. Their hats and weapons were inscribed with a crescent and star insignia of brass. 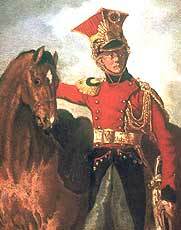 1st Light Horse Regiment (Polish) In 1807 Napoleon authorized the raising of a guard regiment of Polish light horse. They were to be given French instructors and training. But during their first review before the Emperor, their ranks became so entangled that Bonaparte quipped, "These people only know how to fight!" and dismissed their instructors on the spot. But he kept his Poles by his side and the following year at Somosierra they would have another opportunity to prove themselves, on the battlefield instead of the parade ground. Napoleon ordered them to charge against a heavily fortified Spanish artillery position. Armed with only sabres and pistols, they overran four batteries, capturing over 20 cannons and decisively turned the tide. Following this, almost legendary, feat Napoleon proclaimed "Poles, You are worthy of my Old Guard I proclaim you my bravest cavalry!". Promoted to the Old Guard, they were then given lances, remained at the Emperor's side until Waterloo, and were never defeated by enemy cavalry. The 1e Regiment of the Guard developed a rivalry with their fellow Poles of the 1e Vistula Uhlans of the regular Armee. This was not simply based on who was the better unit, but on deep political differences as well, with the Lancers fanatical Bonapartists, while many, if not most, of the Uhlans held fiercely Republican sentiments. Such differences, political and otherwise, between units were not unusual and are well illustrated here. From being instructed by the French, they, along with their Vistula rivals, would go on to serve as instructors and models for the French and most other lancer regiments of the Armée, thus greatly multiplying their fearsome effectiveness. 2nd Light Horse Regiment (French-Dutch) Formed in 1810 from a French and Dutch cadre. They were called Les Lanciers Rouges (the Red Lancers) due to their distinctive uniforms. They too suffered heavily in Russia at the hands of the Cossacks and the hardships of the winter, with most of its men and all but a handful of the horses lost. The regiment was rebuilt in 1813 and it became a powerful unit with its first four squadrons of veterans in the Old Guard and the new recruits of 6 junior squadrons in the young. They would distinguish themselves in numerous engagements, including, finally, Waterloo. Empress Dragoons (Dragons de l'Impératice): Formed in 1806 as the Imperial Guard Dragoon Regiment (Regiment de Dragons de la Garde Impériale), it was renamed in honor of Empress Josephine the following year. Originally candidates had to have at least 6 (later 10) years of service, participated in no fewer than 2 campaigns with citations for bravery, be literate and at least 173 cm tall (slightly shorter than for the Horse Grenadier Guards). No more than 12 candidates from each of the 30 regular Dragoon regiments were allowed to apply at any one call, this quota would later be reduced to 10. Volunteers from other guard regiments were also allowed to transfer. Since this was as much a ceremonial as a combat unit and was rarely committed in battle, billets in the Empress Dragoons were highly sought after positions. As with the Red Lancers, it had squadrons in both the Old and Young guards and served with the Emperor until the end. A French Line Infantry grenadier (left) and voltigeur (right) c. 1808, by Hippolyte Bellangé. Voltigeurs (literally, Vaulters or Leapers) were élite light infantry of the line regiments. In 1805, Napoleon ordered that the smallest, most agile men of the line battalions be chosen to form a Voltigeur company. These troops were to be second only to the Grenadiers in the battalion hierarchy. Their name comes from their original mission. Voltigeurs were to vault upon horses of friendly cavalry for faster movement, an idea which proved impractical if not outright impossible. Despite this, the Voltigeurs did perform a valuable task, skirmishing and providing scouts for each battalion, as well as providing an organic light infantry component for each line regiment. In Voltigeur training, emphasis was placed on marksmanship and quick movement. The Fusiliers made up the majority of a line infantry battalion, and may be considered the typical infantryman of the Grande Armée. The Fusilier was armed with a smoothbore, muzzle-loaded flintlock Charleville model 1777 musket and a bayonet. Fusilier training placed emphasis on speed of march and endurance, along with individually aimed fire at close range and close quarters combat. This differed greatly from the training given to the majority of European armies, which emphasised moving in rigid formations and firing massed volleys. Many of the early Napoleonic victories were due to the ability of the French armies to cover long distances with speed, and this ability was thanks to the training given to the infantry. From 1803, each battalion comprised eight Fusilier companies. Each company numbered around 120 men. The line Fusilier wore a bicorne hat, until this was superseded by the shako in 1807. The uniform of a Fusilier consisted of white trousers, white surcoat and a dark blue coat (the habit long model until 1812, thereafter the habit veste) with white lapels, red collar and cuffs. Each Fusilier wore a coloured pom-pom on his hat. The colour of this pom-pom changed depending on the company the man belonged to, as military uniforms reached their excessive pinnacle at around this period in time. After the 1808 reorganisation, the First company was issued with a dark green pom-pom, the second with sky blue, the third with orange and the fourth with violet. While the Infantry of the Line made up the majority of the Grande Armée's infantry, the Infanterie Légère (Light Infantry) also played an important role. The Légère regiments never numbered more than 36 (compared with the 133 of the Ligne regiments), and the Ligne could perform all the same manoeuvres, including skirmishing. The difference lay in the training and the resulting high esprit de corps. By decree of the Emperor himself, cavalry typically comprised between a fifth and a sixth of the Grande Armée. Cavalry regiments of 800–1,200 men were made up of three or four Escadrons of two companies each, plus supporting elements. In light cavalry and dragoon regiments, the first company of the every regiment's first escadron, was always designated as 'Elite', with presumably, the best men and horses. In the revolution's wake, the cavalry suffered the greatest from the loss of experienced aristocratic officers and NCOs still loyal to the crown of the Ancien Régime. Consequently, the quality of French cavalry drastically declined. Napoleon rebuilt the branch, turning it into arguably the finest in the world. Until 1812 it was undefeated in any large engagements above the regimental level. There were two primary types of cavalry for different roles, heavy and light. The heavy (Grosse) cavalry, equipped and armed almost like the knights of old with a heavy cuirass (breastplate) and helmets of brass and iron and armed with straight long sabers, pistols and later carbines. As with the knights, they served as the shock troops of the cavalry. Because of the weight of their armour and weapons, both trooper and horse had to be big and strong, and could consequently put a lot of force behind their charge. Though the cuirass could not protect against flintlock musket fire, it could deflect shots from long range, offered some protection from pistol fire and could protect the wearer from ricochets. More importantly, in an age which saw cavalry used in large numbers, the breastplates provided protection against the swords and lances of opposing cavalry. Napoleon usually combined together all of his cuirassiers and carabiniers into a cavalry reserve, to be used at the decisive moment of the battle. In this manner they proved to be an extremely potent force on the battlefield, leaving their opponents impressed if not awestruck. The British, in particular, who mistakenly believed the cuirassiers were Napoleon's bodyguard, and would later come to adapt their distinctive helmets and breastplates for their own Household Cavalry. There were originally 25 cuirassier regiments, reduced to 12 by Napoleon initially who later added three more. 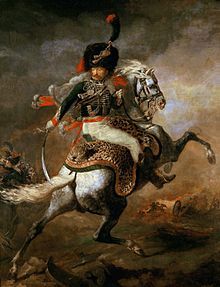 At the beginning of his rule most of Cuirassier regiments were severely understrength, so Napoleon ordered the best men and horse to be allocated to the first 12 regiments, while the rest were changed into dragoons. He also reintroduced the practice of wearing body armor, which had practically disappeared in Europe during the 18th century. The medium-weight mainstays of the French cavalry, although considered heavy cavalry, who were used for battle, skirmishing and scouting. They were highly versatile being armed not only with traditional sabres (the finest with three edges made of Toledo steel), but also muskets with bayonets (which were kept in a saddleboot when riding), enabling them to fight on foot as infantry as well as mounted. Part of the price for this versatility was their horsemanship and swordsmanship were often not up to the same standards as that of the other cavalry troops, which made them the subjects of some mockery and derision. Finding enough of the right kinds of horses for these part-time cavalrymen also proved a challenge. Some infantry officers were even required to give up their mounts for the dragoons, creating resentment towards them from this branch as well. There were 25, later 30, dragoon regiments. In 1815, only 15 could be raised and mounted in time for the Hundred Days. These fast, light cavalrymen were the eyes, ears and egos of Napoleonic armies. They regarded themselves as the best horsemen and swordsmen (beau sabreurs) in the entire Armée. This opinion was not entirely unjustified and their flamboyant uniforms reflected their panache. Tactically, they were used for reconnaissance, skirmishing and screening for the army to keep their commanders informed of enemy movements while denying the foe the same information and to pursue fleeing enemy troops. Armed only with curved sabres and pistols, they had reputations for reckless bravery to the point of being almost suicidal. It was said by their most famous commander Antoine Lasalle that a Hussar who lived to be 30 was truly an old guard and very fortunate. Lasalle was killed at the battle of Wagram at age 34. There were 10 regiments in 1804, with an 11th added in 1810 and two more in 1813. Some of the most feared cavalry in Napoleon's armies were the Polish lancers of the Vistula Uhlans. Nicknamed Hell's Picadors or Los Diablos Polacos (The Polish Devils) by the Spanish, these medium and light horse (Chevau-Légers Lanciers) cavalry had speed nearly equal to the Hussars, shock power almost as great as the Cuirassiers and were nearly as versatile as the Dragoons. They were armed with, as their name indicates, lances along with sabres and pistols. Initially French ministers of war insisted on arming all lancers identically, real battlefield experience however proved that the Polish way of arming only the first line with lance while the second rank carried carbine instead was much more practical and thus was adopted. Lancers were the best cavalry for charging against infantry in square, where their lances could outreach the infantry's bayonets, (as happened to Colborne's British brigade at Albuera in 1811) and also in hunting down a routed enemy. Their ability to scour and finish off the wounded without ever stepping off their saddle created perfect scenes of horror for the enemy. They could be deadly against other types of cavalry as well, most famously demonstrated by the fate of Sir William Ponsonby and his Scots Greys at Waterloo. Excluding those of the guard, there were 9 lancer regiments. After the wars, the British were impressed enough to create their own lancer regiments. The Emperor was a former artillery officer, and reportedly said "God fights on the side with the best artillery." As may therefore be expected, French cannons were the backbone of the Grande Armée's forces, possessing the greatest firepower of the three arms and hence the ability to inflict the most casualties in the least amount of time. The French guns were often used in massed batteries (or grandes batteries) to soften up enemy formations before being subjected to the closer attention of the infantry or cavalry. Superb gun-crew training allowed Napoleon to move the weapons at great speed to either bolster a weakening defensive position, or else hammer a potential break in enemy lines. Besides superior training, Napoleon's artillery was also greatly aided by the numerous technical improvements to French cannons by Jean Baptiste de Gribeauval which made them lighter, faster and much easier to sight, as well as strengthened the carriages and introduced standard sized calibres. In general, French guns were 4-pounders, 8-pounders or 12-pounders and 6-inch (150 mm) howitzers with the lighter calibres being phased out and replaced by 6-pounders later in the wars. French cannons had brass barrels and their carriages, wheels and limbers were painted olive-green. Superb organization, fully integrated the artillery into the infantry and cavalry units it supported, yet also allowed it to operate independently if the need arose. There were two basic types, Artillerie à pied (Foot artillery) and Artillerie à cheval (Horse artillery). The cavalry were supported by the fast moving, fast firing light guns of the horse artillery. This arm was a hybrid of cavalry and artillery with their crews riding either on the horses or on the carriages into battle. Because they operated much closer to the front lines, the officers and crews were better armed and trained for close quarters combat, mounted or dismounted much as were the dragoons. Once in position they were trained to quickly dismount, unlimber (deploy) and sight their guns, then fire rapid barrages at the enemy. They could then quickly limber (undeploy) the guns, remount, and move on to a new position. To accomplish this, they had to be the best trained and most elite of all artillerymen. The horse batteries of the Imperial guard could go from riding at full gallop to firing their first shot in just under a minute. After witnessing such a performance, an astounded Duke of Wellington remarked, "They move their cannon as if it were a pistol!" There were 6 administrative regiments of horse artillery plus one in the guard. In addition to the batteries assigned to the cavalry units, Napoleon would also assign at least one battery to each infantry corps or, if available, to each division. Their abilities came at a price, however, horse batteries were very expensive to raise and maintain. Consequently, they were far fewer in number than their foot counterparts, typically comprising only 1/5 of the artillery's strength. It was a boastful joke among their ranks that the Emperor knew every horse gunner by name. Besides better training, horses, weapons and equipment, they used far more ammunition. Horse batteries were given twice the ammo ration of the foot, those of the guard three times. Of all the types of ammunition used in the Napoleonic Wars the cast iron, spherical, round shot was the staple of the gunner. Even at long range when the shot was travelling relatively slowly it could be deadly, though it might appear to be bouncing or rolling along the ground relatively gently. At short range carnage could result. There were two forms of close-range weapon, which were extremely useful at up to 270 m (300 yards). Grape shot and canister, or case, were the anti-personnel weapons of choice of the gunner. Grape was a cluster of large metal spheres tied together around a central spindle and base and normally sewn into a bag, whereas canister was a metal case filled with smaller iron or lead spheres. The whole purpose of these types of shot was to break up when fired from the gun forming a wide cone of flying metal that acted in the same way as a shotgun cartridge. It is important to know that not all nations shared the same types of artillery projectiles. For example, the Congreve rocket, inspired from the Mysorean rocket artillery, or the Shrapnel shell, which combined the killing effect of grape shot with the ranges achieved by round shot, were used only by the British Army. The "Marins de la Garde" (transliterated as "Sailors of the Guard", but more accurately "Marines of the Guard") were organised into five equipages (ship's company), each with five escouades, with a total strength of 737 men, the unit having been created ostensibly for the preparation of the invasion of England. The unit was almost entirely destroyed in the Spanish Campaign of 1808 at Baylen, but was rebuilt, and in 1810 the battalion was expanded to eight equipages with a total of 1,136 men, but this was severely reduced by the casualties of the Russian Campaign, and only 350 officers and men remained in the ranks in 1813. With Napoleon's first abdication, an ensign and 21 marins accompanied him to Elba, and returned with him for the Hundred Days Campaign when their strength was increased to an equipage of 150 officers and men. The battalions of marine artillery were conscripted for the 1813 campaign, and included four regiments with the 1st regiment intended to have 8 battalions, 2nd regiment 10 battalions and the 3rd and 4th regiments four battalions each, totalling 9,640 men in all serving with Marshal Marmont's 6th Corps. Combined with sailor battalions, these fought as part of the Division de Marine at the battles of Lutzen, Bautzen, Dresden, and won high praise at the Battle of Leipzig. The guard marine units were disbanded in 1815. Many European armies recruited foreign troops, and Napoleonic France was no exception. Foreign troops played an important role and fought with distinction in La Grande Armée during the Napoleonic Wars. Almost every continental European country was, at different stages, a part of La Grande Armée. By the end of the conflict tens-of-thousands had served. In 1805 35,000 troops from the Confederation of the Rhine were used to protect lines of communications and flanks of the main army. In 1806 27,000 more troops were called up for similar purposes, plus 20,000 Saxon troops were used for mopping up operations against the Prussians. In the Winter Campaign of 1806–7, Germans, Poles, and Spaniards helped seize Baltic ports at Stralsund and Danzig on La Grande Armée's left flank. At the Battle of Friedland in 1807, the Corps of Marshal Lannes was formed considerably from Poles, Saxons, and Dutch. For the first time foreign troops had played a role in a major battle, and done so with distinction. In the 1809 Austrian Campaign possibly as many as one-third of the Grande Armée, were from the Confederation of the Rhine, and one-quarter of the Army in Italy was Italian. At La Grande Armée's peak in 1812, more than half the troops that marched into Russia were non-French and represented 20 different countries, including Austrian and Prussian troops. Grawert initially led the Prussian detachment, but was replaced by Yorck. The bridge builders of the Grande Armée, the pontonniers, were an indispensable part of Napoleon's military machine. Their main contribution was helping the emperor to get his forces across water obstacles by erecting pontoon bridges. The skills of his pontonniers allowed Napoleon to outflank enemy positions by crossing rivers where the enemy least expected and, in the case of the great retreat from Moscow, saved the army from complete annihilation at the Berezina. They may not have had the glory, but Napoleon clearly valued his pontonniers and had 14 companies commissioned into his armies, under the command of the brilliant engineer, General Jean Baptiste Eblé. His training along with their specialized tools and equipment, enabled them to quickly build the various parts of the bridges, which could then be rapidly assembled and reused later. All the needed materials, tools and parts were carried on their wagon trains. If they did not have a part or item, it could be quickly made using the pontonniers' mobile wagon-mounted forges. A single company of pontonniers could construct a bridge of up to 80 pontoons (a span of some 120 to 150 metres long) in a just under seven hours, an impressive feat even by today's standards. One of Napoleon's most quoted lines is his dictum that "An army is a creature which marches on its stomach". This clearly illustrates the vital importance of military logistics. The troops of the Grande Armée each carried 4 days' provisions. The supply wagon trains following them carried 8 days', but these were to be consumed only in emergency. One man was allotted to 750 grams of bread, 550 grams of biscuits, 250 grams of meat, 30 grams of rice, and 60 grams of grain; one liter of wine was shared between four men. Insofar as possible, Napoleon encouraged his men to live off the land through foraging and requisition of food (which was known as La Maraude). An integral part of the French logistics system was the inclusion in every regiment of several women known as cantinières (also known as vivandières, but "cantinière" was by far the more common term among French troops). These women were married to soldiers in their regiments, and acted as sutlers, selling food and drink (especially alcohol) to the troops. They were considered "absolutely necessary" to the functioning of the army, and the Consular Decree of 7 Thermidor, Year VIII set their number at four per battalion and two per cavalry squadron. These women fed the troops when all other logistical arrangements broke down. Additional supplies would be stockpiled and stored at forward bases and depots which he would establish before the start of his campaigns. These would then be moved forward as the army advanced. The Grande Armée's supply bases would replenish the Corps and Divisional depots, which in turn would replenish the Brigade and Regimental supply trains, which would distribute rations and ammunition to the troops as needed to supplement their foraging. The reliance on foraging was sometimes determined by political pressures. When marching over friendly territory armies were told to "live off what the country can supply", but when marching over neutral territory they were issued with supplies. It was this system of planned and improvised logistics which enabled the Grande Armée to sustain rapid marches of up to 15 miles per day for up to 5 weeks. The logistical system was also aided by a technological innovation in the form of the food preservation technique invented by Nicolas Appert, which led to modern canning methods. While the technology and practice of military medicine did not advance significantly during the Napoleonic wars, the Grande Armée did benefit from improvements in the organization of staff and the establishment of a Flying Ambulance system, by its Surgeon General, Baron Dominique Jean Larrey. After seeing the speed with which the carriages of the French flying artillery manoeuvred across the battlefields, Baron Larrey adapted them for rapid transport of the wounded and manned them with trained crews of drivers, corpsmen and litter bearers. This forerunner of the modern military ambulance and triage system, was eventually adapted by armies throughout the world in the following decades. And this Dr. Larrey invented the «ambulances volantes» – "flying" ambulance (so-called due to their emphasis on speedily, or "flying", rushing the critically injured back to the field hospital for surgery). However, Larrey's rival, one Baron L.P. Percy, was the first to actually introduce much needed reform to the French Army's medical services. He was the first to introduce "a regularly trained corps of field litter bearers, soldiers regularly formed and equipped for the duty of picking up the wounded...and carrying them on stretchers to the place where means of surgical aid were provided" and thus also deserving of some credit. (Longmore, p. 26.) The differences between Percy's and Larrey's systems lay in their fundamental objectives. Percy's ambulance served mainly as a means of transporting surgeons and their instruments close to the engaged elements. In turn, stretcher-bearers could radiate from such proximity to retrieve the wounded. In contrast, Larrey's flying ambulance, though a much lighter and swifter carriage, was designed to follow the advanced guard and provide initial treatment to the wounded (by applying dressings on the field of battle) while emphasizing the need to rapidly transport the more critically injured away from the battlefield. Wounded were, thus, evacuated to points in the rear where surgeons could more effectively perform lifesaving procedures within not more than half an hour (Larrey, 1814, vol I, pp. 223–24.) The ambulances were horse-drawn wagons, modelled after the "flying artillery", for the collecting and carrying the wounded from the battlefield to the field hospitals. He first proposed this system in a report from the Italian Campaign of 1797 (Larrey, vol I, 1814, pp. 27–28.). The personnel for a given ambulance team included a doctor, quartermaster, non-commissioned officer, a drummer boy (who carried the bandages), and 24 infantrymen as stretcher bearers. As a result, Larrey increased the mobility and improved the organization of field hospitals, effectively creating a prototype for the modern Mobile Army Surgical Hospital. Because of Larrey's efforts, and the popularity of his reforms of that of Baron Percy's, every regiment, division and corps had its own medical staff, consisting of corpsmen to find and transport the wounded, orderlies to provide assistance and nursing functions, apothecaries, surgeons and doctors which was more than any other army of the day would offer until around the time of the Crimean War and American Civil War. Even so, conditions in the Grande Armée, as in all armies of the time, were primitive at best. Far more soldiers died of their wounds or from sickness than in battle (see Napoleonic Wars casualties). There was little knowledge of hygiene and nothing of antibiotics. The main surgical procedure was amputation, since the bleeding of a limb could be more easily controlled, and curare, an anesthetic that helps relax muscles, had yet to be developed as an anesthetic (although it was under experimentation during this time). The only means of anaesthetic consisted of strong alcoholic drink, or even, in some cases, knocking the patient unconscious. Opiates such as laudanum were available (in theory) for pain control. Typically only about two-thirds survived the operation. Accounts of the ordeals of the wounded are horrific reading. Napoleon, himself, once noted "It requires more courage to suffer than to die", so he made sure those who did survive were given the best treatment available at the best hospitals in France, in particular Les Invalides, while they recuperated. In addition, the wounded survivors were often treated as heroes, awarded medals, pensions and provided with prosthetic limbs if needed. Knowing that they would be promptly attended to, then honored and well looked after once back home, helped boost morale in the Grande Armée, and thus further contributed to its fighting abilities. Chappe's system comprised an intricate network of small towers, within visual range of one another. On top of each was a 9-metre mast, with three large, movable wooden rods mounted on them. These rods, called the régulateur (regulator), were operated by trained crews using a series of pulleys and levers. The four basic positions of the rods could be combined to form 196 different "signs". Provided with good crews of operators and decent visibility conditions, a sign could be sent through the 15 station towers between Paris and Lille, a distance of 193 km (120 mi), in only 9 minutes, a complete message of 36 signs in about 32 minutes. From Paris to Venice, a message could be sent in only six hours. Chappe's telegraph soon became one of Napoleon's favourite and most important secret weapons. A special portable version semaphore telegraph travelled with his headquarters. Using it he was able to coordinate his logistics and forces over longer distances in far less time than his enemies. Work was even begun on a wagon-mounted version in 1812, but not completed in time for use in the wars. While Napoleon is best known as a master strategist and charismatic presence on the battlefield, he was also a tactical innovator. He combined classic formations and tactics that had been used for thousands of years with more recent ones, such as Frederick the Great's "Oblique Order" (best illustrated at the Battle of Leuthen) and the "mob tactics" of the early Levée en masse armies of the Revolution. Napoleonic tactics and formations were highly fluid and flexible. In contrast, many of the Armée's opponents were still wedded to a rigid system of "Linear" (or Line) tactics and formations, in which masses of infantry would simply line up and exchange vollies of fire, in an attempt to either blow the enemy from the field or outflank them. Due to the vulnerabilities of the line formations to flanking attacks, it was considered the highest form of military manoeuvre to outflank one's adversary. Armies would often retreat or even surrender if this was accomplished. Consequently, commanders who adhered to this system would place a great emphasis on flank security, often at the expense of a strong centre or reserve. Napoleon would frequently take full advantage of this linear mentality by feigning flank attacks or offering the enemy his own flank as "bait" (best illustrated at the Battle of Austerlitz and also later at Lützen), then throw his main effort against their centre, split their lines and roll up their flanks. He always kept a strong reserve as well, mainly in the form of his Imperial Guard, which could deliver a "knockout blow" if the battle was going well or turn the tide if it was not. March Column (Colonne de Marche): The best formation for rapid or sustained movement of troops and a good melee attacking formation, but it offered little firepower and was also vulnerable to flank attack, ambush, artillery and "funneling". Wedge (Colonne de Charge): An arrow or spearhead shaped cavalry formation, designed to close rapidly and break the enemy's line. Classic, and effective, mounted formation used throughout history, and still used by tanks today. But if the wedge is halted, or its attack loses momentum, then it is vulnerable to counter-pincer attack on its flanks. Attack Column (Colonne d'Attaque): A wide column of infantry, almost a hybrid of line and column, with light infantry skirmishers in front to disrupt the enemy and screen the column's advance. Once the column closed, the skirmishers would move off to its flanks, then the column would fire a massed musket salvo and charge with their bayonets. An excellent formation against a standard, thin line. The Attack Column was developed from the "Mob" or "Horde" tactics of the early French revolutionary armies. Its disadvantages were a lack of massed firepower and vulnerability to artillery fire. Mixed Order (Ordre Mixte): Was Napoleon's preferred infantry formation. Some units (usually regiments or battalions in size) would be placed in line formation, with other units in attack column behind and in between them. This combined the firepower of the line with the speed, melee and skirmishing advantages of the attack column. It also had some of the disadvantages of both, so support from artillery and cavalry were especially vital for this tactic to succeed. Open Order (Ordre Ouvert): Foot and/or horse would spread out by unit and/or individually. This formation was best for light troops and skirmishers. It allowed for rapid movement, especially over "broken" or rough terrain such as hills or forests, and offered the best protection from enemy fire since the troops were spread out. Its disadvantages were it did not allow for massed or volley fire and was terrible for melee or close quarters fighting and thus, especially vulnerable to cavalry. Grand Battery (Grande Batterie): An alternative artillery tactic, when circumstances prohibited the flying batteries. Artillery would mass its fire at a single, crucial point on the battlefield (usually against the enemy's centre). It could be devastating if the enemy was caught by surprise or in the open. But massing large numbers of guns in a single area without the enemy's knowledge could be tricky. Once the batterie opened fire and its target became clear, measures could be taken to avoid it. It was also vulnerable to Counter-battery fire from enemy artillery and needed protection from cavalry attack. Although this has become the most well known French artillery tactic, Napoleon preferred the flying batteries and used it only when he had to or thought it posed a better chance of success. Often at the start of a battle, he would mass batteries into a Big Battery, then after a few salvoes, break it up into flying batteries. In the early campaigns it was rarely used, but as the quantity of the Armée's horses and quality of its artillerymen declined, Bonaparte would be forced to employ it much more frequently in later battles. Unlike the armies of the Ancien Régime and other monarchies, advancement in the Grande Armée was based on proven ability rather than social class or wealth. Napoleon wanted his army to be a meritocracy, where every soldier, no matter how humble of birth, could rise rapidly to the highest levels of command, much as he had done (provided, of course, they did not rise too high or too fast). This was equally applied to the French and foreign officers, and no less than 140 foreigners attained the rank of Général. By and large this goal was achieved. Given the right opportunities to prove themselves, capable men could rise to the top within a few years, whereas in other armies it usually required decades if at all. It was said that even the lowliest private carried a marshal's baton in his knapsack. Maréchal d'Empire, or Marshal of the Empire, was not a "rank" within the French Army, but a personal title granted to distinguished Divisional generals, along with higher pay and privileges. The same applied to the Corps commanders (General de Corps d'armee) and army commanders (General en chef). The highest permanent "rank" in Napoleon's army was actually Général de division and those higher than it were positions of the same rank but with separate insignia for appointment holders. The position of Colonel General of a branch (such as Dragoons or Grenadiers of the Guard) was akin to Chief Inspector-General of that branch, whose office holder used his current officer rank and its corresponding insignia. Wikimedia Commons has media related to Grande Armée. ^ Mearsheimer 2001, p. 285. ^ Bodart 1916, p. 126. ^ Christian Wilhelm von Faber du Faur, Campagne de Russie 1812: d'après le journal illustré d'un témoin oculaire, éditions Flammarion, 1812, 319 pages, p. 313. ^ Eugène Labaume, Relation circonstanciée de la Campagne de Russie en 1812, éditions Panckoucke-Magimel, 1815, pp.453–54. ^ Napoleon's Guard Infantry – Moyenne Garde, Accessed March 16, 2006. ^ FUSILIERS DE LA GARDE 1806 – 1814 ARMEE FRANCAISE PLANCHE N" 101, Accessed March 16, 2006. ^ Grand Tenue – Marines de la Garde, Accessed March 16, 2006. ^ Tirailleurs de la Garde Imperiale: 1809–1815, Accessed March 16, 2006. ^ Napoleon's Polish Lancers, Accessed March 16, 2006. ^ a b "Décret, 18 février 1808". Correspondance de Napoléon Ier. 16. Imprimerie Impériale. 1864. pp. 338–341. ^ Crowdy, Terry (2015). Napoleon's Infantry Handbook. Pen and Sword. pp. 6ff. ISBN 978-1-4738-5244-0.